I love this creative gardening technique. It hits on so many of my happy Bonzai buttons that it makes me giddy! First of all, you’re growing your own food, which of course I think is divine. Secondly, this is some super small-scale gardening, because you utilize the vertical ‘dead’ space by growing *up* instead of *out*. As well, this is essentially container gardening, and can be accomplished on a concrete patio without access to actual ground. Both of these benefits make this a perfect project for a small area, like an apartment courtyard or a crowded townhouse farmyard. But the icing on the vegan cupcake, is that you’re re-using old unwanted tires, and recycling them into functional farming equipment. PLUS you get taters! Woo-hoo! There are lots of ways to go about finding old tires (scout service stations and recycling centers), but I think the Internet is the easiest answer. I just posted a ‘wanted’ add on Craigslist, and within hours I was flooded with dozens of emails from people asking me to please, please take their tires away. Easy-peasy. Not just any old grocery tuber. You want organic, seed-quality taters, specially selected for their disease resistance and quality yield. Your local nursery will carry certified seed potatoes. There are tons of varieties to choose from, but this year I started small with Russets, Reds, and Yukon Golds. Yum! A week or so before planting, put your potatoes in a warm and well-lit area to induce sprouting. Small buds will grow from each eye, making the eyes easier to locate. A few days before planting, cut the potatoes into large chunks, ensuring that each has *at least* one or two eyes. These are your seeds, and each one will become a potato plant. Let them sit a few days to form a scab, which will help prevent rotting in the ground. Potatoes like full sun and warm soil, so the more exposed the spot, the better. If you consider old tires an eyesore, try to hide your stacks out of sight. 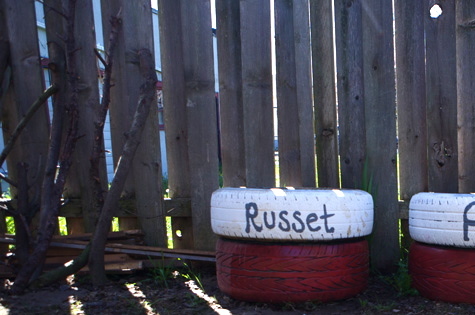 Personally, I love the look of scrappy, haphazard gardens and found-object art. There’s no purpose behind painting them, but I had some red left over and thought they’d make a nice match for the raised beds. I do so love a colorful (and coordinated!) backyard. You could of course leave them black – an aesthetic that would work in a more minimalist, industrial sort of spread. Or on the flipside, I think these spires would look splendid painted petal pink, completely covered in glitter! HA! Not all tires have the same diameter, so determine the largest and lay it down first. This will be your base. Load it up with soil, making sure to fill up the inside of the tire casing completely. 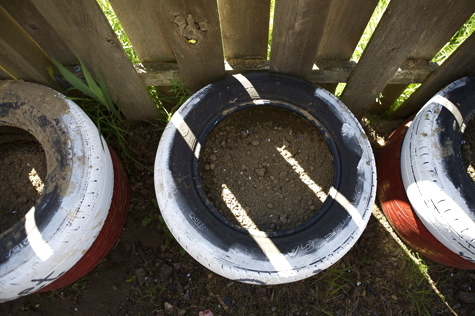 Set your second largest tire on top of the first and fill it with soil, about half way full. 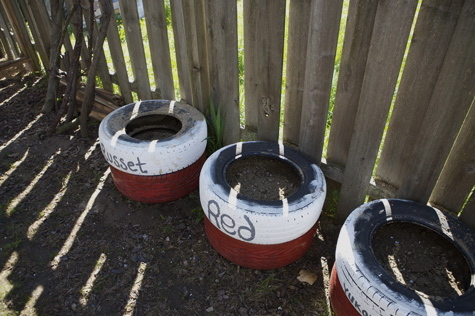 Place the potato seeds in the tire center, and cover them with more dirt. Use enough to fill the tire nearly full, but not all the way. Give it a thorough watering, and you’re good to go! Water your taters well, and make sure the water soaks all the way down through the bottom tire. Water extra liberally when the plant is in flowering mode, and immediately after. Try to do this in the morning, because leaves that remain damp over night are more prone to disease. When the plant is 8 or so inches tall, add another tire and fill in the soil around the stalk. Leave a few inches uncovered to prevent suffocation. Wait until the shoot reaches 8 inches again, and then repeat. At summers end, the foliage will begin to brown and die back. You should stop watering at this point, but you don’t get to harvest quite yet. The potatoes need a few more weeks to mature. Harvest the taters before the first rain, or they’ll begin to will rot in the ground. After you gig them up, allow them to rest in a dry place for a few days. This gives them a nice solid skin for long-term storage. Potatoes will keep in a cool dry place for up to 6 months. A four-tire stack is supposed to yield about 25 pounds of tubers! @ hailey – That’s awesome, and I’m glad I could help! I would *love* to hear how it works out for you, when you harvest and it’s all said and done. Luck! @ Brian Halverson – your welcome! Good luck! I wanted to point out that there is one downside to growing potatoes in tires…the rubber from the tires will leach chemicals into the dirt which, in turn, leaches into the potatoes. The same concept can be applied to anything that is stored in plastic. I considered using tires for gardening, however after research I decided against it – it pretty much cancels out the purpose of growing your own veggies. I actually do the majority of my gardening in raised beds utilizing a “dirtless” concept…in essence, nothing is grown in dirt. It sounds strange but it works quite well. I have towering tomato plants (some are over 5 ft tall), bushy bean and snow pea plants, and wonderful strawberry patches. Your website is fabulous – keep up the great posting! I’d love to hear more about your dirtless method. If you ever feel like sharing, I’m really interested! I am doing the same and now just might copy your adorable tire painting scheme. They are SO CUTE~ I live in the country so no neighbors to care but I think it’s very clever. I’m four tires up and I think that’ll do it. Thanks for sharing…here I go! Good tip. Am I correct in guessing that this would work for sweet potatoes as well? @Leigha – I wonder if there is any kind of way that you might be able to seal the tires so that they wouldn’t be able to leach chemicals out into the soil? The reason so many people will jump at the opportunity to give their old tires away is that you have to pay to dispose of them. Nobody wants them. Why? Tires don’t degrade. EVER. They will not leech anything into your foods when used as a planter. And the black rubber heats the soil inside which is what the seeds like. 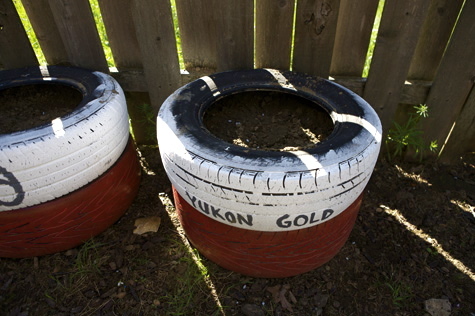 You can actually extend your growing season by using tires. I’m with you Sayward. 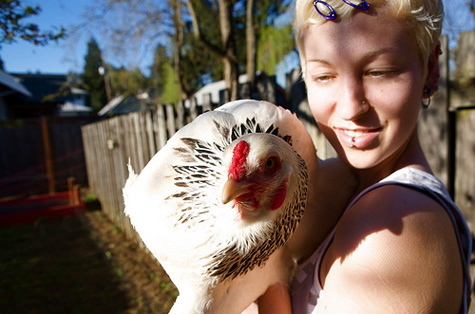 I researched like mad because the last thing I wanted to do was grow tainted food. There simply is NO evidence of chemicals leaving the tires. And there’s no limit to what you can plant in them or how you can arrange or paint them. My next project is to cut the side walls off of 6 of em and use em for a compost container, adding a new tire each time i fill one. After that, I’m building a staggered planter retaining wall. @ Conspiracy2Riot – Thanks! I found the same thing in my research, but I also understand people’s concern. I think you just have to do what you’re comfortable with. But that’s awesome you’ve found so many uses for old tires. I love the recycling aspect of the whole project. Good luck with the future plans! Hi there! I was wondering where you got this idea to begin with? thanks!! So how high are your tire piles? Are they 3 tires high? Please post your harvest yields when the time comes to harvest! Hope this works for you! have just started my garden. i like the idea real well. am looking for 4 big tractor tiers. i want to start by putting them 2 high. and then i can plant carrots and such in them easy for weeding i’am thinking. and be better for concerving on water too. I buy it in bulk from a supplier here in the city. Lots of gardening stores deliver by bulk. You can also look on Craigslist and often find people giving away their leftovers for free, especially this time of year. I plan on growing so taters this year with tires. Can sweet potatos grow this way? Actually I don’t think they can, I think they grow quite differently and won’t work with this method. Sorry! One way to make sure you’re getting water down to the bottom tire would be to use a small diameter perforated PVC pipe ( 2″ diameter would work well) wrapped in a couple layers of geotextile fabric (prevents soil from filling the pipe but allows water to pass through). Stand the pipe up like a stake (6′ lengths, bury 1′ in the ground below the 1st tire), and you’re good to go. Place your hose in the pipe and turn the water on. You could fertilize all the way to the bottom with manure tea. This summer I am attempting this project with sweet potatoes. Thanks for the link. As an ardent, organic gardener, I just couldn’t believe that growing food in old petroleum based tires wouldn’t risk contamination. It just doesn’t make good, scientific sense. Although I’d love to see a safe way to recycle tires, feeding them to my family isn’t an option. Going to try this today! And definitely going to paint them- looks really cute! Quick question- when you put the potato seeds in the second tire, about how many do you use? I use 2-3 seed potatoes per tire. ok, so I wondered about the sweet potato idea because we love them and found this website: http://www.freeplants.com/sweet-potatoes.html Thought it might be helpful. Don’t think I will try it again. Thanks for your detailed instructions and photos. Best wishes! I chose recycled cedar from an old sauna. There’s something about mixing food and rubber that doesn’t sit well with me. This version interlocks together using 45 degree miter joints. If you’re handy, it’ll take you about two hours to construct. I think it is just great how they are growen how smart it is .My husband and myself are trying it.